What is a charter party bill of lading? What are the differences between a charter party bill of lading and a bill of lading? How to use a charter party bill of lading in a letter of credit transaction correctly? On this page I will try to explain you “Charter Party Bill of Lading” and its applications in letters of credit transactions. 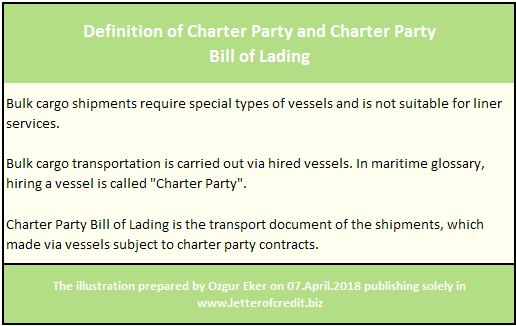 Charter Party Bill of Lading is one of the transport documents that is specifically governed by the letter of credit rules. The international shipping industry is responsible for the carriage of around 90% of world trade. Maritime container transportation is carried out by container ship operators, who produce negotiable bill of loading or non-negotiable sea waybill as transport documents. Unlike container transportation, bulk cargo shipment requires special types of vessels and is not suitable for liner services. As a result, bulk cargo transportation is carried out via hired vessels. In maritime glossary, hiring a vessel is called “Charter Party”. Charter Party Bill of Lading is the transport document of the shipments, which made via vessels subject to charter party contracts. 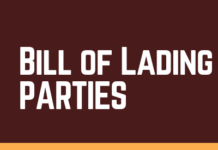 Charter party bill of lading is covered under article 22 of UCP 600. – the charterer or a named agent for or on behalf of the charterer. Any signature by the master, owner, charterer or agent must be identified as that of the master, owner, charterer or agent. Any signature by an agent must indicate whether the agent has signed for or on behalf of the master, owner or charterer. An agent signing for or on behalf of the owner or charterer must indicate the name of the owner or charterer. 3. indicate shipment from the port of loading to the port of discharge stated in the credit. The port of discharge may also be shown as a range of ports or a geographical area, as stated in the credit. 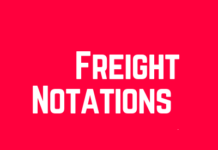 4. be the sole original charter party bill of lading or, if issued in more than one original, be the full set as indicated on the charter party bill of lading. 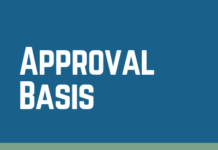 If a credit requires presentation of a charter party bill of lading or if a credit allows presentation of a charter party bill of lading and a charter party bill of lading is presented UCP 600 article 22 is applicable. A transport document containing any indication that it is subject to a charter party is a charter party bill of lading under UCP 600 article 22. 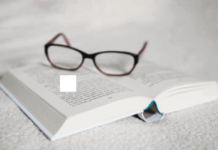 If a credit does not state a notify party, the respective field on the charter party bill of lading may be left blank or completed in any manner. 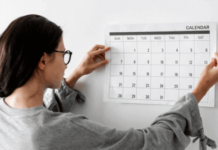 How to Determine Date of Shipment on a Road Transport Document? 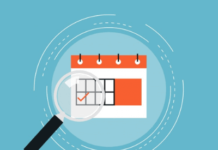 How to Determine Date of Shipment on a Charter Party Bill of Lading?